Home › Latest News › Motorcycle Live 2017 – the UK’s biggest motorcycle show – is underway. Motorcycle Live 2017 – the UK’s biggest motorcycle show – is underway. Bikes on display are numerous; the stars of the all-new nine-bike Softail® range are there and, yes, the only Sport Glide™ in the country, fresh from its reveal in Italy, is taking centre stage. 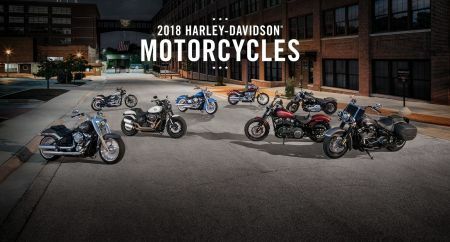 Touring, Street and Sportster Harley-Davidsons are big on the attention front – when you blend the increasing popularity of these models with the latest 2018 paint schemes is it little wonder these bikes pull crowds of all ages? You can experience Harley-life to an even greater extent with Harley-Davidson’s Jumpstart™, a static riding experience on a Street Rod or Softail Slim. Jumpstart bikes are very, very popular especially with riders and non-riders getting their first taste of riding a Harley. Another big hit is the Harley-Team’s resident DJ, who is pumping out tunes in the chill out area located next to a selection of the top Dark Custom bikes that featured in this year’s “Battle of the Kings” dealer-led customisation contest. See them for yourself and you can then imagine what sort of art-on-wheels can be created for you by your local Custom kings in every Authorised Harley dealership. These bikes share space with a tight collection of Harley-Davidson racing bikes, starting with flat trackers XR750 and the latest XG750R, and including Team Harley UK’s shale and sand tracking Street Rod. Motorcycle Live opened its doors on the 18th November and finishes this Sunday, 26 November 2017. There’s plenty of time left to visit the show for yourself but don’t forget you’ll need extra time to check out the Harley-Davidson stand. But don’t just take our word for it… watch the video here and see for yourself.